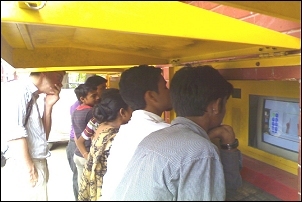 Every step taken by Hole-in-the-Wall is an endeavor to improve its initiatives and explore new boundaries. One such recent development is the collaboration with internationally renowned organizations, Stichting Child Tuition and Twig, both with their focus on developing content that allows enough space for children to explore and learn on their own. Stichting Child Tuition is a Dutch charitable trust that aims at combating illiteracy by establishing a basis for communication. They chose English as a language and thus, started spreading English language literacy through computer programmes that allows self-learning. In 2010, Child Tuition collaborated with HiWEL in India and a pilot was carried out in the tribal villages of Hemalkasa. Child Tuition English learning softwares were provided at the HiWEL Learning Station and the response, progress etc. of children using the Learning Station was observed. The success at this site led to another pilot in September 2011 in the urban slum area of Delhi, adjoining Madangir. Results showed that the softwares could teach children English without any adult supervision. The second phase of the same is presently being tested at the same location where an upgraded version of the software has been provided to children and researches are being conducted on children who have already used the first phase content as well. Twig, on the other hand, focuses on creating Science learning materials, mainly films and videos that are mapped to the school curriculum of children in the age group of 10-16. The content includes comprehensive set of brand new 3 minute films with visuals to support science teaching, sourced from 20 of the best archives around the world including that of BBC and NASA. Twig, Science in Action, as it is called, was launched in the UK in 2011 and the learning materials, a collection of over 600 films rigorously researched by academicians have already reached more than 300 schools across the country. The content includes quizzes and lesson ideas for students of all abilities and promotes self-learning through its easy-to-comprehend audio-visuals. In India, Twig collaborated with Hole-in-the-Wall for a pilot study on how Twig videos help children learn science independent of a teacher/supervisor, as opposed to other material available on the internet. In November 2011, the pilot was carried out in a Government School in South Delhi with an objective is to see whether children can answer ICSE and GCSE questions using Twig content. In order to study this, children were asked to answer the questions individually and then using twig content and also using Google the answers in the second phase of the study. A statistically significant difference was observed in the performance of students after using the TWIG content in comparison to Traditional test. The second phase of study revealed that many students could recall the answers after three months and the performance of students using Twig content and Google was almost at par with each other.